Patrick Tam spent a few months in the early 1980's as a postdoctoral fellow in the Jacobson and Meier labortories. His stay was very productive and several papers resulted. There were papers on mouse somitomeres, and on neurulation in the mouse. 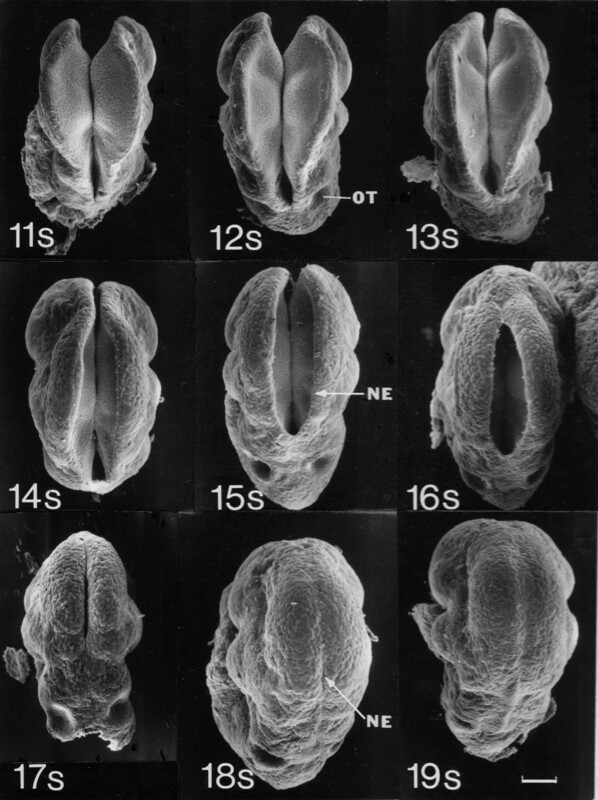 The work on cephalic neurulation in the mouse embryo is discussed here. "Cephalic Neurulation in the Mouse Embryo Analysed by SEM and Morphology. Antone G. Jacobson and Patrick P.L. Tam. The Anatomical Record 203:375-396 (1982)" (1.2MB pdf here) . 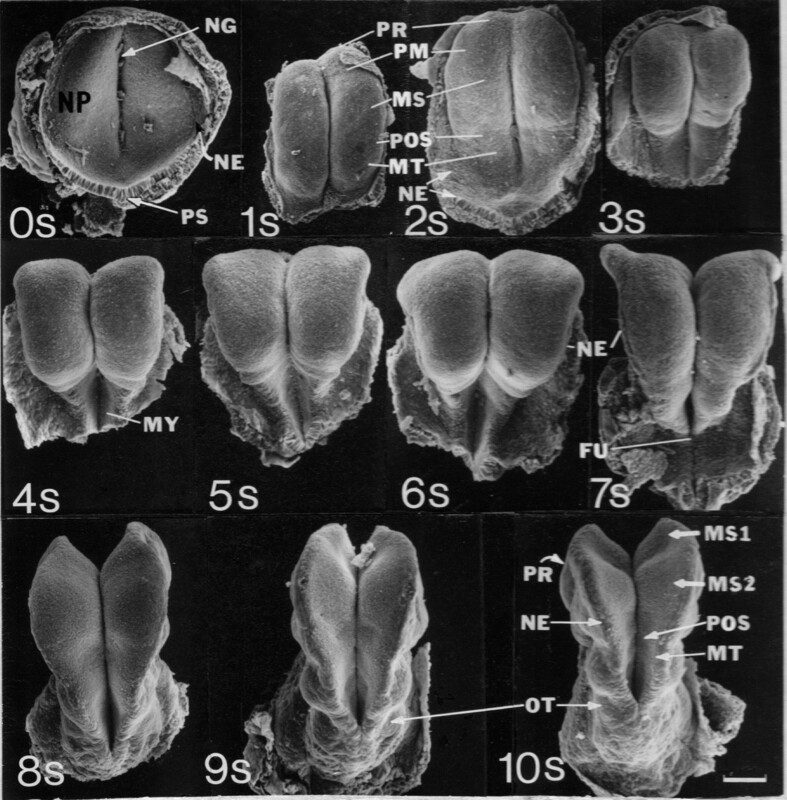 The object of our study was to describe better the morphogenesis of the cephalic neural plate of the mouse embryo, using mainly analysis by scanning electron microscopy (SEM) over a 20 hour period of development. On the illustrations, timing is by somite number. 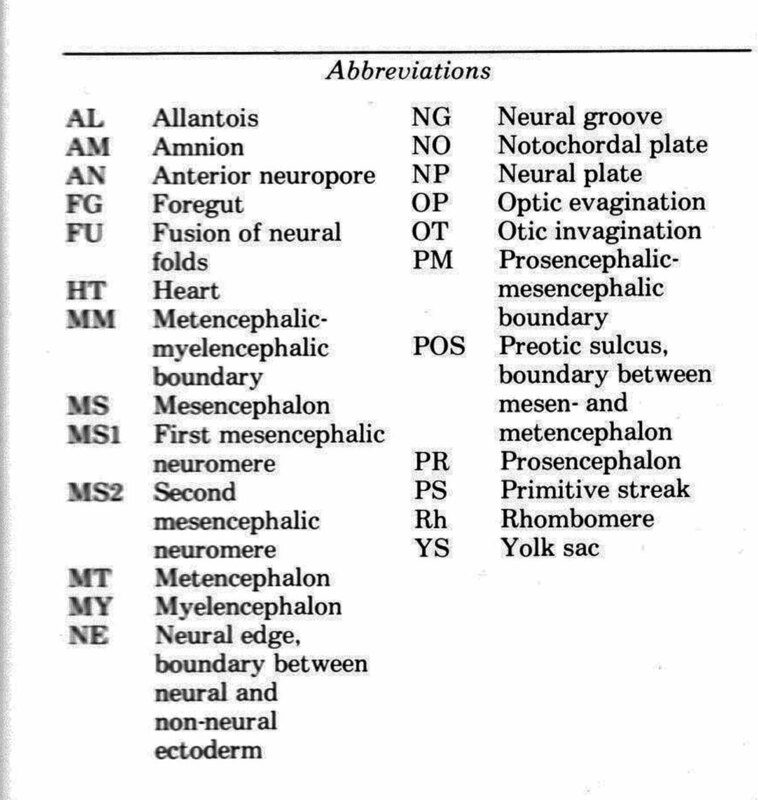 Below is the list of abbreviations for the illustrations that follow. Above are scanning electron micrographs of dorsal views of mouse neural plates and tubes, dissected free of enveloping tissues. Examples begin at zero somites (0S) at 8.0 days post coitum, and are shown for each additional somite from one (1S) to 19 (19S). All are at the same magnification. The scale bars are 0.1 mm. 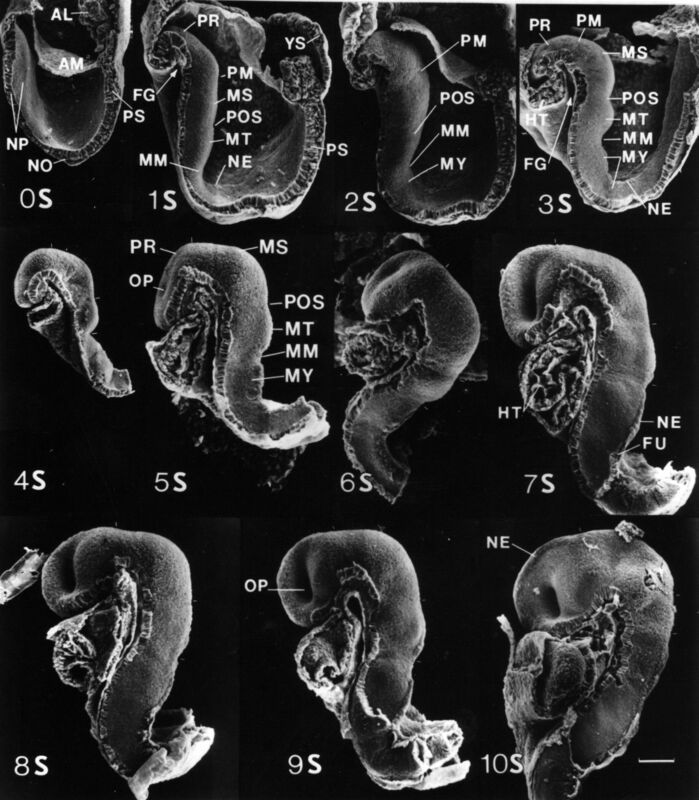 Since a somite is added every hour, the sequence illustrates about 20 hours of development. In early stages (0s to 6s) the cranial neural plate bulges toward the viewer, just the opposite direction to that needed to close the plate into a tube. Beginning at stage 6s, the neural folds (NE) become visible, and interactions between the epidermis and neural plate in the neural fold region produce a powerful force that rolls the plate into a tube despite the continued bulging in the opposite drection. Above are SEM's of medial views of mouse embryos hemisected along the long axis and dissected free of enveloping tissues. Each example is about an hour older than the preceding one, beginning with zero somites (0S) at 8.0 days post coitum. The whole embryo is shown in 0S to 3S, but only the cephalic parts in 4S on. All are at the same magnification. The scale bar is 0.1 mm. These examples parallel those shown in the previous figure. 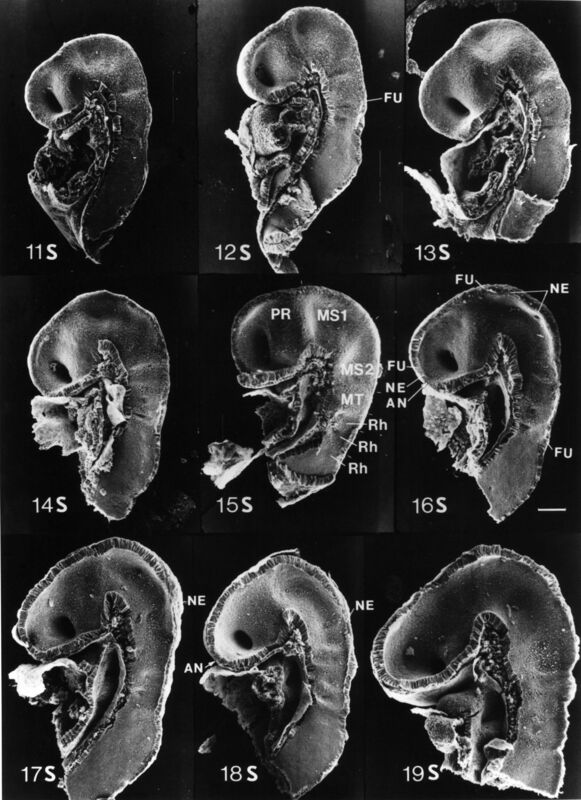 The mouse embryo folds at the boundary between the brain and the spinal cord. This fold doubles the embryo back upon itself. This is seen in 0S to 3S. From 4S on, only the brain part is shown.